Christian Schmid is professor for sociology at the Faculty of Architecture at ETH Zurich and scientific director at ETH Studio Basel / Contemporary City Institute. In 1991 he was cofounder of the International Network for Urban Research and Action (INURA). 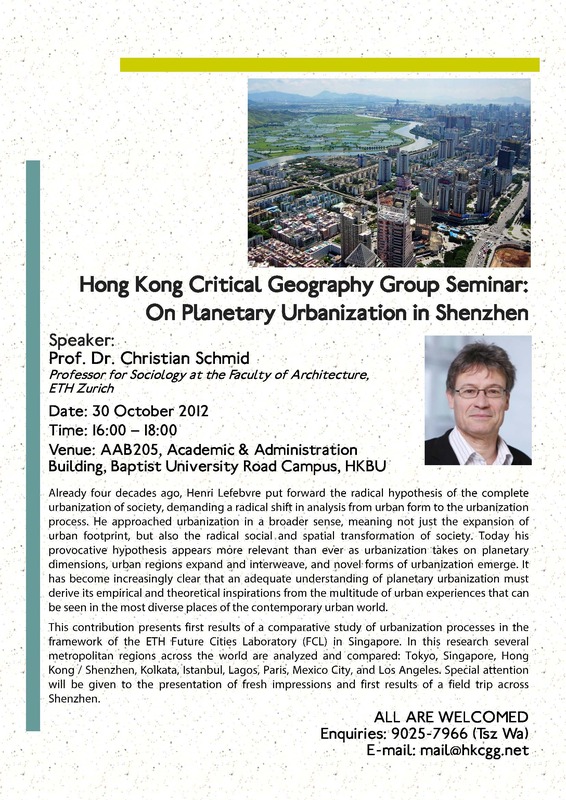 His scientific work is on urban development in international comparison, and on theories of the city and of space. He is the author of Stadt, Raum und Gesellschaft: Henri Lefebvre und die Theorie der Produktion des Raumes (Steiner 2005), a leading work on Henri Lefebvre’s theory of the production of space, and he is the co-editor of Space, Difference, Everyday Life: Reading Henri Lefebvre(Routledge 2008). Together with Swiss architects Roger Diener, Jacques Herzog, Marcel Meili, and Pierre de Meuron he has authoredSwitzerland – an Urban Portrait (Birkhauser 2005), a novel analysis of the urbanization process in contemporary Switzerland. Since 2011 he is leading the research project Patterns and Pathways of Planetary Urbanization, a comparative analysis of urbanization processes in Tokyo, Singapore, Hong Kong / Shenzhen, Kolkata, Istanbul, Lagos, Paris, Mexico City, and Los Angeles. The project is part of the ETH Future Cities Laboratory in Singapore.